The Confederation Bridge is one of the world's longest continuous pre-stressed-concrete, box-girder, bridges built over seawater, and is the longest span ever built over ice-covered water. It stretches 13 km from Borden, on Canada's Prince Edward Island, to Cape Tormentine, New Brunswick. Construction of the Confederation Bridge was an awe-inspiring event; ongoing, long-term monitoring and research projects add to the bridge's reputation as an engineering marvel. Built to withstand the harsh environment of the Northumberland Strait, the Confederation Bridge was designed to provide a service life of 100 years. To better understand short- and long-term bridge performance, a multi-year monitoring and research project was established during construction. The research will contribute to the development of load models for future long-span bridges. Monitoring instruments, some installed during bridge construction, include more than 500 strain-measuring devices, 450 thermal sensors, 28 ice-load panels, 12 tiltmeters, 76 vibration sensors, and underwater sonar equipment. Six Campbell Scientific CR9000 Measurement and Control Systems are at the center of the instrumentation. These high-speed data acquisition systems are connected to a computer via fiber optics. The CR9000s have been making continuous high-speed measurements since 1998. When predetermined trigger amplitudes caused by ice impacts, seismic activity, heavy vehicular traffic, or high wind speeds are detected, all loggers are triggered to store pre-trigger and post-trigger data. The collected data are transmitted to researchers at Carleton University in Ottawa and the University of Calgary for further analysis. Of particular interest are the following areas of monitoring and research, discussed below. The interaction between ice and bridge piers is monitored and analyzed using 28 ice-load panels installed on the pier's ice shield. Each ice panel is divided into eight impact zones that function as load cells. Strain gages in each zone produce a "Wheatstone bridge" signal. The 224 differential signals are converted to single-ended signals and bandlimited to approximately 5 Hz before the amplified and filtered signals are sent to two CR9000s. Ice flow and ridge impacts, the resulting forces of these impacts, and the response of the bridge are measured. Long-term data will be used to better understand ice forces. Changes in the bridge concrete, movement of the foundations, and loss of tension in prestressed steel reinforcements can, over time, cause deformations in the bridge structure. These deformations are monitored, using laboratory and on-site tests, to determine the relaxation of steel and the creep and shrinkage of concrete over a 20-year period. Sensors document the response of the bridge to daily and seasonal temperature variations (thermal stress). Monitoring conducted during and after construction includes laboratory testing and simulation of thermal properties of concrete and calibrations of computer models. The data from sensor measurements are being stored in a database. The database will be used to determine future trends. Research will be conducted on the load combination techniques for significant load effects on bridge designs. The results will help develop load models for long-span bridges as well as future operational strategies. 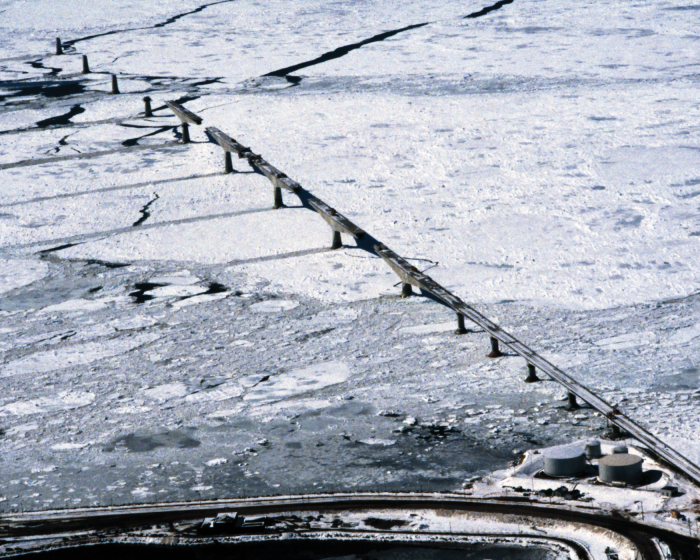 Before monitoring on the Confederation Bridge began, no such models existed. Wind, traffic, ice impact, and earthquakes can cause bridge vibration. To measure vibration, 75 accelerometers are distributed throughout a 1 km section of the bridge. The accelerometer signals are filtered and sent to dataloggers distributed along the same section. Monitoring the vibrations helps produce computer modeling and analysis techniques for determining vibration responses and the spatial variation effects of seismic-ground motion. This will advance knowledge in structural dynamics, particularly seismic and wind-resistant design engineering for long-span structures. Mike Montreuil, National Research Council; John Halloran, Campbell Scientific, Inc.